For Your Safety Please Hold On. Kayla Czaga. Nightwood Editions. Gibsons, British Columbia. 2014. I've never quite experienced the like. The first few poems of this collection had me dizzy with joy, a little like the first time you saw Wayne Gretzky, or the first time you saw Mikhail Baryshnikov fly. You've never read family portraits like those in For Your Own Safety Please Hold On. Kayla Czaga writes like she has 200 years of wisdom coursing through her veins. She uses language we are all familiar with but somehow escapes the bounds of previous gravity, these plain speaking poems soar. In my corrupted opinion this is the best book of poetry I have read this year. No one in the office here at TODAY'S BOOK OF POETRY disagreed. in small change from my father for Christmas. of snow to the bank, Good luck, here's a bag. he cuts such slender metaphors from the earth. Czaga in For Your Safety Please Hold On has a new intensity, you don't see it coming as much as feel it. These poems are universally personal, crowd-sourcing intimate. Joyce Carol Oates is vastly under-rated if you ask me, and we here in the office at TODAY'S BOOK OF POETRY all agree on that point, her novels have always had a way of making me feel as though I were inhabiting a world of her design. What I mean is that her universe becomes yours. It is a familiar even though it is new terrain. Kayla Czaga knows the same trick. When she is writing about family it sounds suspiciously like she is writing about your own. When she writes about herself she almost makes you think you are looking in a mirror. with your three-point smile and hairdo. in circles with hands covering my face. I don't know how old Kayla Czaga is -- but I know she is young. I can't even imagine how fine her future poems will be. But I am certain I'll be anxious to read them, and after reading For Your Safety Please Hold On you will be too. So many books and so little time, but this is one I will read again, and then, a while later, again. Why? Like watching a magician on video with fast forward, slow motion, replay, I want to learn her tricks. mishearing him say, Remember you are blessed. open, Mary robed in blue, mourning into his feet. to sew onto its back--the flying rabbit. until we held them up to the light. For Your Safety Please Hold On should be front page news for everyone who loves poetry, mandatory reading for everyone who doesn't. Kayla Czaga grew up in Kitimat and now lives in Vancouver, BC, where she recently earned her MFA in Creative Writing at UBC. Herpoetry, nonfiction and fiction has been published in The Walrus, Best Canadian Poetry 2013, Room Magazine, Event and The Antigonish Review, among others. 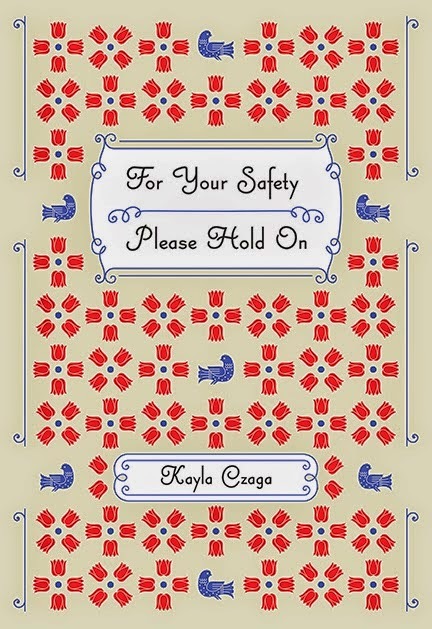 For Your Safety Please Hold On is her first book. "Funny, smart, sophisticated, guileless: reading Czaga is like drinking a glass of water in a desert. Every once in a while there arrives a young poet whose astonishing aptitude for the craft rises so clearly, so beautifully, the relief is palpable. For Your Safety Please Hold On is Czaga’s answer to Moure’s Domestic Fuel and Solie’s Short Haul Engine... and like Moure and Solie we don’t need to expect great things from her. Great things are already here." "Kayla Czaga's For Your Safety Please Hold On recalls what was radical about Robert Lowell's Life Studies a half century ago. With wit and empathy, it moves beyond the confessional to reclaim the intimate and personal as an adventurous subject for poetry. Reading it is like being brought into someone's home and told all the family secrets--never an imposition, it feels rather like an initiation into the clan. I thoroughly enjoyed it." THE KITTY LEWIS HAZEL MILLAR DENNIS TOURBIN POETRY PRIZE is awarded annually to the book of poetry that I, Michael Dennis, like the most. The award was named for Kitty Lewis and Hazel Millar who were instrumental to this blog during its' formative steps. It is also named for the late painter, poet and all around wonderfully generous Dennis Tourbin whom I loved. The award is virtually meaningless - except that the winner is entitled to a home cooked meal, with wine, if they ever come to Ottawa.